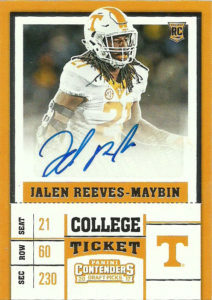 Jalen Reeves-Maybin was a standout linebacker for the Tennessee Volunteers from 2013-2016. After his Freshman year playing primarily on special teams, Reeves-Maybin posted 240 total tackles, 27 TFL, 8 sacks, 4 passes defended, 1 interception, and 2 forced fumbles. He was selected in the 4th round of the 2017 NFL Draft by the Detroit Lions after an injury plagued Senior season sent his draft stock plummeting. Considered a low risk, high upside coverage linebacker, Jalen has been brought along slowly by the Lions. He started no games his rookie season, but made an impact, finishing the year with 30 tackles, 2 pass breakups, 2 forced fumbles, and .5 sacks.